Technology-enabled insights can empower CFOs to drive increased visibility of one of the most critical metrics in any business: cash flow. 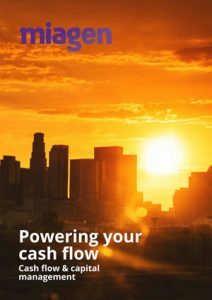 Best-in-class businesses successfully shorten the cycle time from asset investment to cash flow, improve profit to cash conversion and achieve more free cash flow. Miagen’s driver-based cash flow planning systems help organisations to plan and manage their full cash flow requirements. This white paper includes brief descriptions of customer projects in financial services, aviation, energy and IT services.